After a day of shopping and gambling in Las Vegas (once again, I did not win!) it was time to head to my second home, Bangkok. Today I would be flying American Airlines to Los Angeles and then connecting to Thai Airways flight TG795 to Bangkok. Not a usual combination of flights since they are on seperate alliances but it was the end of one ticket and the start of another. I arrived at the airport by taxi and approached the deserted check-in counters. 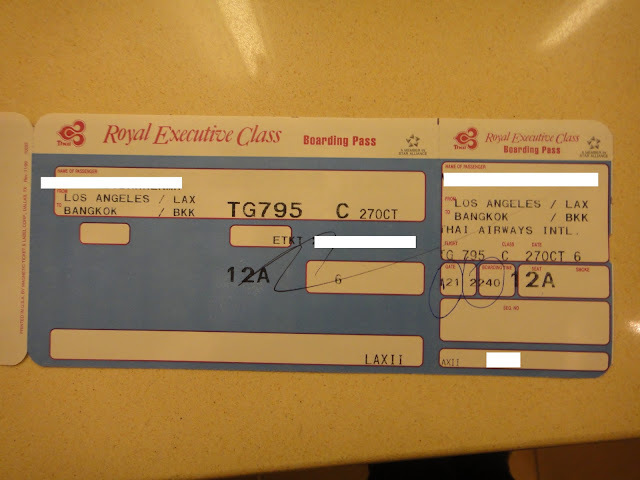 I asked the check-in agent whether it was possible to interline my bags on seperate tickets from AA to Thai Airways. She had no issue tagging the bags right through, saved me a lot of hassle lugging my suitcase between terminals in Los Angeles. Unfortunately there is no Oneworld lounge at Las Vegas McCarran International Airport, but the place is loaded with slot machines if you are that way inclined (I'm on holidays, why not!). After security I took the airside train to the D gates and found a slot machine near gate D37 while I waited for the aircraft to arrive on its inbound flight from Los Angeles. I was mindful of my connection time in Los Angeles of a little over 2 hours, since I was on seperate tickets I could not afford for anything to go too badly wrong. This caused a few problems as the flight was packed and the bins were overflowing! The last few passengers ended up delaying the flight because of all the carryon they were bringing on board. It ended up having to be put in the hold before we could finally depart. With such a short flight time the pilots enjoyed a meal on the ground during the turnaround. For the rest of us we would have a drinks service only during the flight. A few minutes after takeoff the flight attendant offered a snack mix bag and drink of your choice. I took an apple juice. The remainder of the flight was routine and we had a straight in approach to the runways facing west in Los Angeles. By the time we disembarked the delay was only about 40 minutes in total, I had been worried it would be more. Fortunately the AA terminal at LAX is right next door to the Tom Bradley International Terminal (TBIT) that Thai Airways departs from. Not having to worry about my bags, I quickly walked between terminals with my carryon and headed to the Thai checkin counters. The check-in counters were quite busy with seperate queues for economy, premium economy and royal silk class. I joined the royal silk line, but some passengers were taking forever to checkin and the premium economy line was moving much faster. Eventually it was my turn and I presented my baggage tag from American Airlines and I was offered my boarding pass for TG795. The boarding passes being used seemed to be extremely old, they certainly weren't the usual cards I was used to seeing. They said 'Royal Executive Class' instead of Royal Silk. The lines for security were extremely long. It was very busy with many international departures going out at around the same time. There was a priority lane for first and business class, but it was almost as slow as the ordinary queue and it took about 30 minutes to clear security. Eventually I was through and made my way to the joint Star Alliance lounge. It is upstairs and you have to take an elevator to get there. With a 17 hour flight ahead of me, I decided a quick shower would be wise. The shower rooms were quite stylish and clean and had all the basic amenities one needs. Water was hot and I left feeling nice and refreshed. It's a pity the food offerings were so poor. I ended up with a small turkey sandwich and packet of nuts along with a glass of Chardonnay. I was soon bored in the lounge so I went for a wander to see if there was any shops worth checking out. I walked towards the gate expecting an array of duty free stores, but there was absolutely nothing! I noticed asian faced security staff in plain suits wandering around the departure gate, I'm not sure who they were but they stuck around and monitored the passengers boarding the flight. Was there some kind of security threat I didn't know about? I wondered if they worked for the Thai government or whether they were employed in the USA. We ended up boarding about 30 minutes behind schedule. I had selected a seat in the forward business class cabin and was in the 2nd row window seat, 12A. The Airbus A340-500 used on this route has 2 business class cabins, a premium economy cabin and an economy cabin at the rear. I was welcomed on board and got comfortable. 12B was soon occupied by another Australian passenger. Menu's and noise cancelling headsets were already on each seat. The blankets were not the usual thick duvet type blankets, but instead just a larger economy class style blanket. At the time of this flight many Thai Airways regular passengers had been reporting on Flyertalk about this kind of blanket being used on many flights. They really are of a very low standard and I mentioned it to the flight attendant who appeared just as confused as I was about it. Why would Thai switch to these blankets after they had recently improved the headsets and amenity kits in business class?? It makes no sense. Interestingly, my next flight to Melbourne had the proper duvet so maybe it was just a temporary thing. After a long takeoff roll we lifted off and crawled into the night sky. The A340-500 fully loaded with fuel has a nice long climb to initial cruise as she is very heavy! We tracked north along the Californian coast initially before heading out over the pacific. Once in the cruise, I decided to check out the loo! This aircraft features windows in the lavatory... there's nothing like doing your business while you glance out the window at the passing landscape... although not much to see over the Pacific at night! Not long after our late night departure the crew commenced meal service. The first meal is the most significant of the flight and is served in courses. We started with a small plate of nuts followed by a drinks service. I was on the Piper Heidsieck champagne. Drinks were served from a trolley. Overall the meal was very filling and quite enjoyable. After the trays were cleared away the lights were turned off and most passengers went to sleep, with a few staying up and making use of the Audio Video On Demand system. I had a couple of short naps but never really settled into any solid sleep. I went for a walk around the cabin and found the flight was only about 70% full. Around 9 hours into the flight breakfast was served. The lights were switched on and breakfast came on a single tray. I opted for the crepes with egg. It did not come with bacon as advertised in the menu. Instead there was some kind of brown thing, I have no idea what it was and I did not eat it! The crepes were nice though. I feel the presentation of Thai business class breakfasts would be a lot nicer if they put the yoghurt in a proper bowl. The breakfast was accompanied with a selection of rolls and croissants. After breakfast the lights were switched off again and I spent my time watching TV or movies on the IFE system. About 90 minutes before landing, it was time for our third and final meal service. By this stage we had been in the air a full 15 hours but I still felt relatively comfortable despite not having much sleep. It's just nice to be able to stretch out on the angled lie flat seats and relax. I decided to take the pasta option for the last meal. It did not have a lot of flavour and I felt it looked a bit cheap to be honest. I probably should have taken the asian style options for meals 2 and 3. I ate it anyway and I never felt hungry at any time. The crew came around and collected the headsets and any remaining service items during the descent. Overall the crew had been quite cheery and polite throughout the flight despite the fact that most of them were flight attendant 'veterans'. It's been a couple of months since I took this flight so I can't remember how good the crew were with regards to bringing drinks around during lights out but I don't remember that it was particular bad. I was not addressed by name at all through the flight, as is quite standard on Thai in my experience. Fortunately we parked at a jetway and did not require a bus to take us to the terminal, so it was not long after we parked that I was at baggage claim and on my way. So ends my USA status run, only one flight left to get back home to Melbourne. Stay tuned for the conclusion to this story soon!